'Tien Shan' (Elm Jensen, R. 2004). Seedling PALCB-1-J. AB (OGB), 32" (81 cm), Midseason bloom. 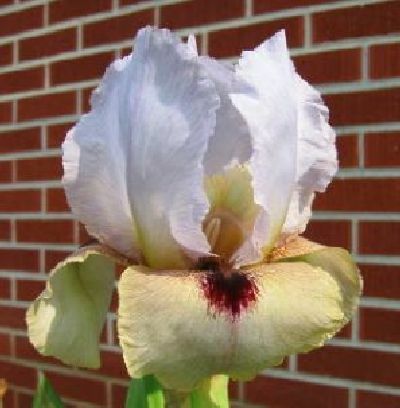 Standards pale lavender-blue; style arms pale yellow with blue stripe, crests yellow striped green; Falls pale beige-yellow flushed green, rose veining and stippling at hafts and around beards, long wedge-shaped burgundy signal; beards bronze; pronounced sweet fragrance. 'Pleasure Ahead' X 'Love Came By'. Malevil 2005.